Big news!! Bruno and I have NBN - and that means that the day that I record my live video I am able to put it on Youtube and have it uploaded all in the same day!! I am SO EXCITED about that. So in case you missed my live Facebook Video today here is the recording. We tried something different today and used Switcher Studio and so far so good.... There are still some things to work out, but I am sure we will get better with practice. I used the NEW Big Shot Embossing Mats in my video today and found a new way to create a sandwich that works well for me - I hope that it works for you too and can show you how easy it is to create amazing embossing using thinlits!! So exciting the possibilities that open up because of these mats. If you don't want to hear my chatting... I won't be offended, you can skip to 23 mins into the video to just see the Embossing Mats section. Don't be leaving comments that you don't like me talking - because that is one thing I am good at! hahahaha. I would love for you to pin my video and feel free to subscribe to my YouTube Channel too! If you want to watch my Live Video's each week on Facebook Here is the next event with times in your timezone linked too. Click on the images below to purchase these items in our online store today! Join my Crazy Crafters Team today! Click on join NOW above to get an amazing deal! OnStage LIVE April 2019 | Auckland, New Zealand | Day 2 Summary and THREE videos!!!!!! Kylie's Card Templates - Do you find card measurements Frustrating?? OnStage LIVE: Auckland - Wanna see my swaps? Make Your Dreams Happen | CUTE CARD ALERT!!!!!! All images are Copyright Stampin’ Up! 1990 to 2017, unless otherwise stated. All content is the sole responsibility of Kylie Bertucci Independent Stampin’ Up! 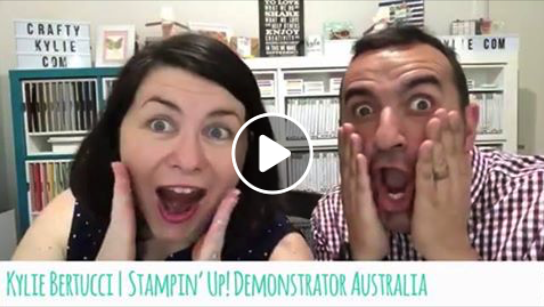 Demonstrator & the use of & content of the classes, services & products offered on this website are not endorsed by Stampin’ Up! Kylie-Jo Bertucci Stampin' Up! Demonstrator. Powered by Blogger.